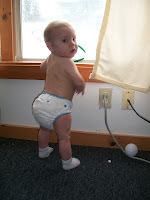 The Cloth Diaper Foundation: oodles of goodmamas Contest Winner! oodles of goodmamas Contest Winner! In honor of our oodles of goodmamas, your extremely close guess of 960 diapers has won you one Goodmama of your choice! Please choose from any diaper at http://shop.thegoodmama.com/ and contact us! The cloth diaper foundation, from January 1 to March 22 (not including the Goodmama diapers - that was after the post!) sent out 974 diapers! That included diapers for 52 recipient babies as well as 350 diapers in the Mystery Boxes. Thank you for all of the guesses! This was fun for me to see how much you guys "over worked" me in your minds!! Just a little note to Monique, who had me shipping "well over 12,000"! You're REALLY funny!! Haha! That would be a LOT of packages!! You've won the honor of carrying the title of the most "Out There" Guess! However, if we had 1,000 recipients in 3 months, I would be HONORED to send that many! I won??? or another Monica!? What a wonderful attitude about this. Thanks for posting!